We saved something sweet for last for the final tutorial in the 12 Days of Christmas series. Layers of melt and pour scented with Moroccan Mint and Dark Rich Chocolate Fragrance Oils create delicious smelling (and looking!) guest-sized soap. 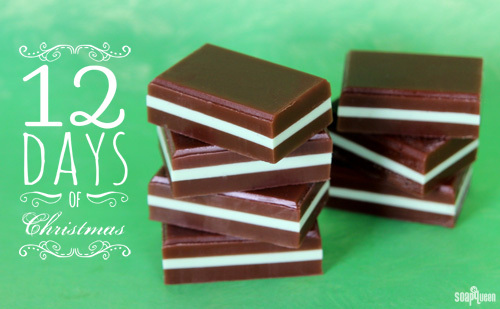 Reminiscent of a classic mint candy, this project is easy to make and great for beginners. 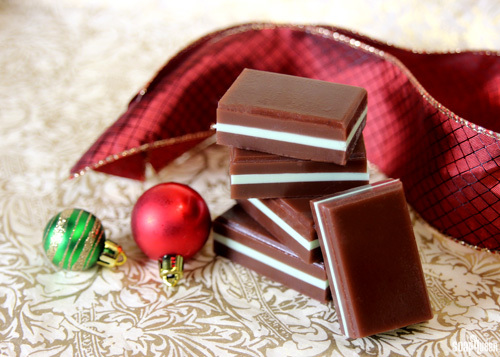 These minty, chocolatey soaps would make an amazing holiday gift for any chocolate lover in your life. 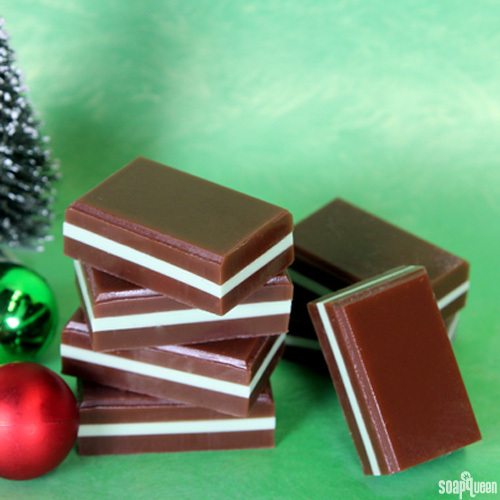 Wrap these soaps in green wrapping paper for a great finishing touch. 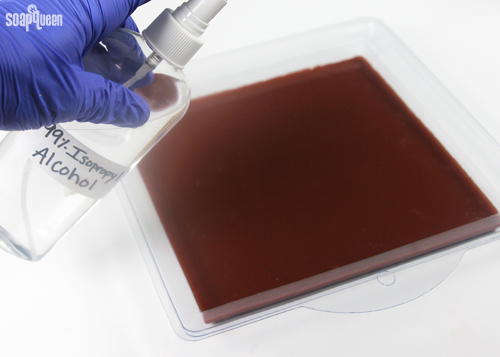 Remember to have a spray bottle of 99% isopropyl or rubbing alcohol on hand for this project! Spraying with alcohol is key to the layers sticking together. To learn more about creating layers with melt and pour soap, check out the Basic Layers Soap Queen TV episode. Click here to add everything you need for this project to your Bramble Berry shopping cart! ONE: Cut and melt 24 oz. of clear melt and pour in the microwave using 20 second bursts. Add pieces of the Brown Oxide Color Block, and stir to fully incorporate the color. 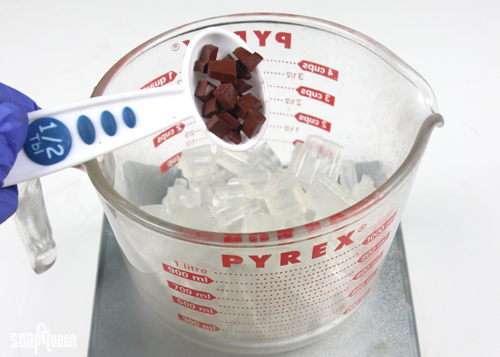 TWO: Add 13 mL Dark Rich Chocolate Fragrance Oil, and 13 mL Vanilla Color Stabilizer and stir until fully incorporated. Pour half of the melted brown soap into the mold, and spray with 99% isopropyl alcohol or rubbing alcohol to disperse any bubbles. Allow the layer to fully cool and harden. 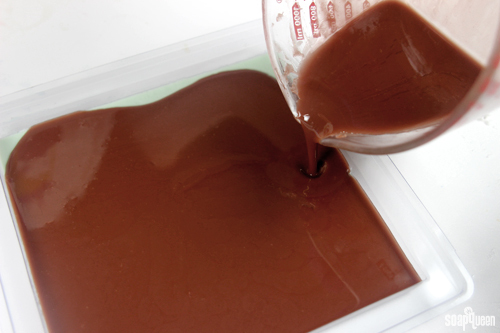 THREE: In a heat safe container, cut and melt 8 oz. white melt and pour in the microwave using 15 second bursts. 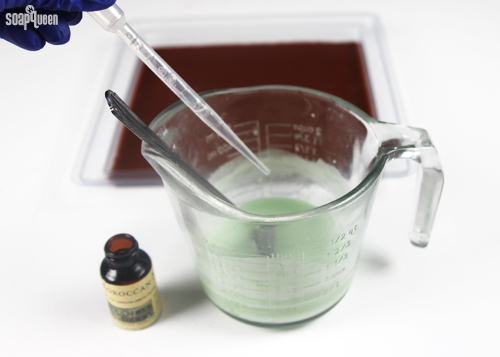 Add shavings of the Chrome Green Oxide Color block until a soft green is achieved. Add 4 mL of the Moroccan Mint Fragrance Oil and stir to thoroughly combine. FIVE: Once the soap has reached a temperature below 125 °F, spray the brown layer with 99% isopropyl alcohol and pour the green soap on top. If your soap is hotter than 125 °F, it can melt the bottom layer. Spray the green soap with alcohol to disperse any bubbles and allow to fully cool and harden. SIX: Reheat the remaining brown soap using 15 second bursts. 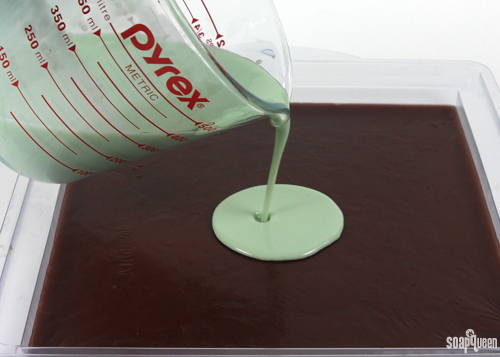 Once the soap is completely melted and below 125 °F, spray the green soap with 99% isopropyl alcohol. Pour the brown soap on top of the green layer, and spray with alcohol to disperse any bubbles. Previous Post: You Did It! Is it possible to do this on the stove? I’d prefer to avoid the microwave if possible. Thanks! I wondered about adding the vanilla color stabilizer. It must be added to keep the middle mint layer from turning brown since there is a brown layer on either side of it. Let me know if this is correct. My house smells so good right now!!!!! But, I don’t get it. Why do you use Vanilla stabilizer, only to add brown right back with color? Wouldn’t Chocolate FO just color it brown on its own?